Those with a pear body shape struggle with issues from top to bottom: slender upper bodies that are difficult to build with small bust-lines, thin shoulders and straight waists leading down to thick lower bodies that are prone to packing on weight. 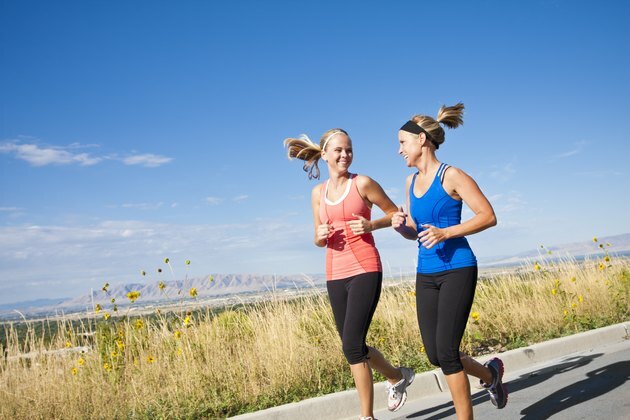 Unfortunately, you can't change your body shape, but you can plan your workouts around exercises that slim and tone your lower body while optimizing your upper body for an attractive, healthy, balanced look. There's no such thing as spot reducing, so don't go looking for exercises that promise to trim down and tone up just your lower body. The best exercise for pear-shaped women to reduce fat in the problem area below the waist is any type of aerobic exercise. That's because in order to trim fat from your hips, thighs and glutes you have to trim it from your entire body. Exercises that get your heart rate up such as running, biking, rowing and working on the elliptical trainer will shift your metabolism into fat-burning gear to take off fat from all over your body, including the lower part. The best lower body exercises focus on toning and firming up the hips, glutes and thighs, the three adjoining parts that make up the "problem area" for pear shaped women. Exercises such as squats, lunges, single leg and glute kickbacks, hamstring curls and scissors jumps are examples of moves that will strengthen and tone glutes, hips and thighs for a shapely, but not bulky, lower body. Don't get so caught up in trying to minimize your lower body that you forget to give some attention to your upper body. The best exercises for pear body shapes include focusing on shoulders, triceps, chest and even the abs to balance out your physique and underplay your lower body. 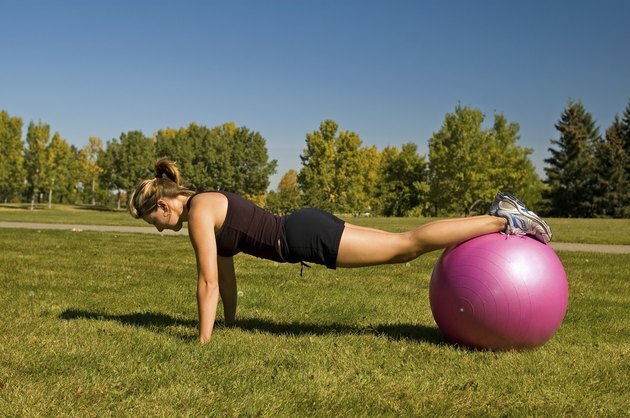 Perform pushups while supporting your legs at the shins on a stability ball. Increase the challenge and add an abs element by lifting alternate legs between pushups. Do triceps kickbacks, and dips on a bench to benefit your triceps and shoulders. Include side planks, which can easily transition to mermaids -- and don't forget to add in crunch exercises, working traditional crunches along with twisting crunches and side bends to target your obliques along with your ab muscles. Pear-shaped women will get the most out of the best exercises for their body shape by employing some general slimming techniques. Your diet, for example, has everything to do with whether or not your workout is effective. As you increase your calorie burn through cardio exercise, reducing your calorie intake will result in quicker full-body weight loss, including trimming fat from your lower body. 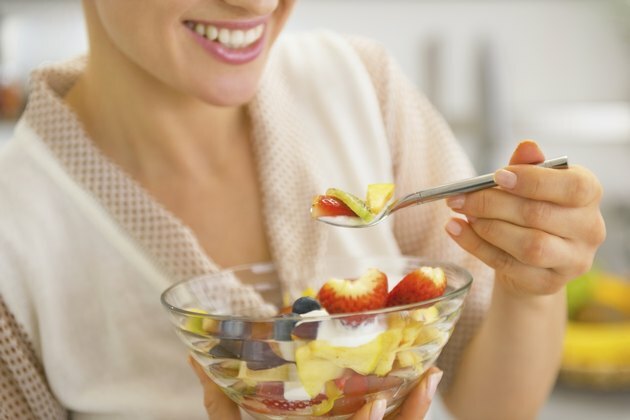 Eat nutritious foods such as lean protein, whole grains and fresh fruits and vegetables. Drink mostly water and reduce or eliminate drinks that lack nutritional value such as soda and alcohol. Interval training is the best way to make the most of your cardio workouts because it's effective at getting your heart rate up for high-calorie burning. An example on a treadmill would be to warm up for five minutes then run full-speed for 45 seconds. 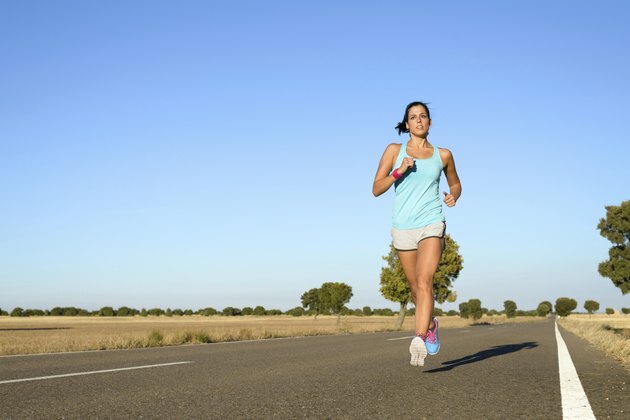 Slow your pace down for a recovery interval of 60 to 90 seconds, then speed back up. Continue to alternate intervals for 20 minutes then cool down for five minutes.